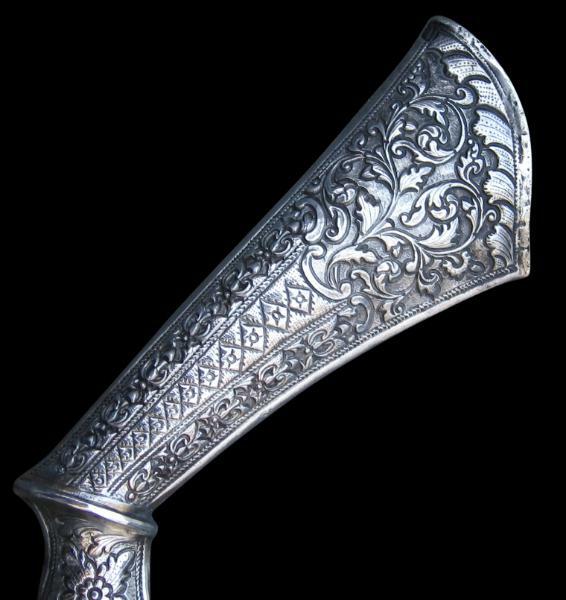 This relatively large badek (also sometimes spelt badik) dagger has a pistol shape, possibly modelled after the early European pistol. badek are covered in sheet silver and are particularly well repoussed with traditional Malay motifs such as scrolling vines. 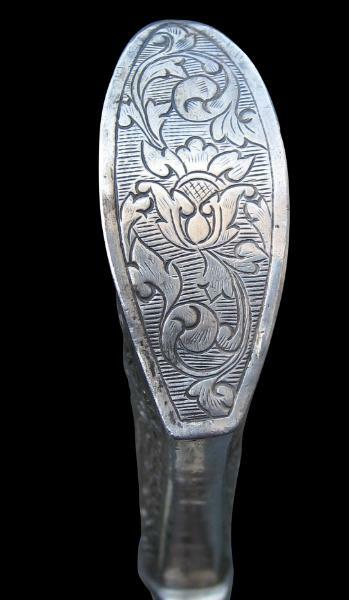 The end of the hilt is finely engraved with an orchid and leaf motif. The scabbard has a wooden interior. The sharp, single-edged blade of watered iron has an excellent wavy pamor. Badeks were meant for cutting rather than stabbing and are found across the Malay archipelago particularly among Bugis and Bugis-influenced groups. The silverwork on this example is among the finest that we have seen. Asian Civilisations Museum A-Z Guide, 2003. Islamic Arts Museum Malaysia, The Message and the Monsoon: Islamic Art of Southeast Asia, IAMM Publications, 2005.